We’ve all been duped. 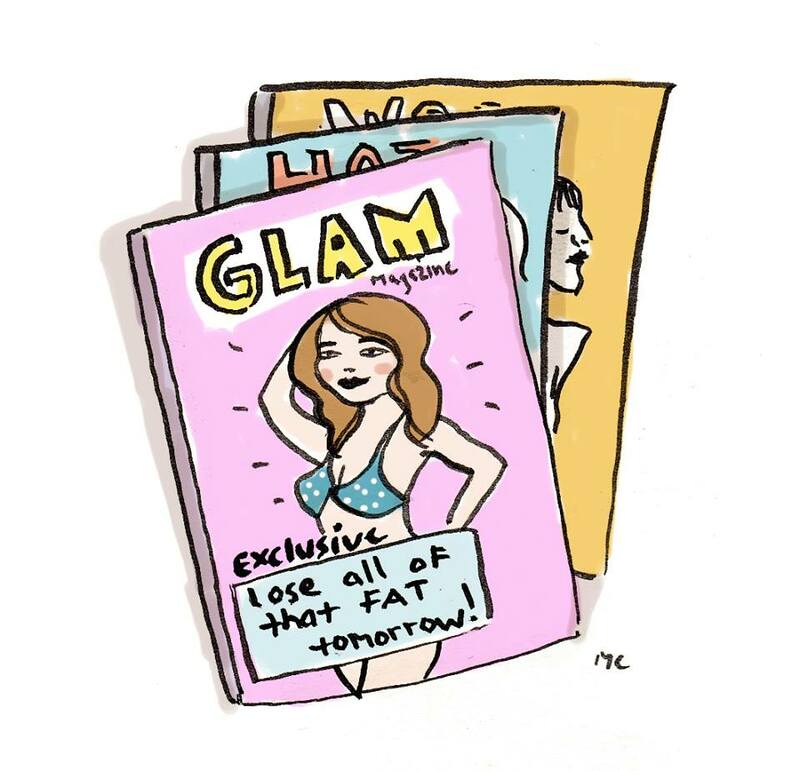 After years of TV watching, magazine reading, advertising exposure and media dominating our worlds, too many of us have internalized sneaky media lies that normal, average and regular, healthy women all maintain a weight of about 100-125 and wear between a 00 (yes, that’s a double zero) and a 4. Those are the only numbers we ever hear. Everything else is kept top secret, as if weighing more than 125 at any height is a horrible shame to keep locked inside or to be reserved only for grim “before” stories of extreme body makeovers. Celebrities tend to keep their weight/size stats on the down-low for the most part, but occasionally we are hit with some numbers — whether written into scripts, divulged in interviews or leaked by stylists. Zoe Saldana weighs 115, as declared in a May 2013 Allure magazine headline. In the movie “500 days of Summer,” the gorgeous sought-after girl next door (Zooey Deschanel as Summer), is described as being of “average” height and “average” weight, which is listed on the screen as 5’5″ and 121 lbs. Jennifer Lopez told Vogue in March 2012 that she is “just a regular woman. I wear a size 6.” In the pilot episode of “30 Rock,” Jack Donaghy (boss man Alec Baldwin) says he could deduce anything about Liz Lemon (employee Tina Fey) from their first meeting. She says, “What? Are you going to guess my weight now?” He replies, “You don’t want me to do that” (in a threatening “you-would-be-ashamed-if-I-said-it-out-loud” manner). Shortly after, he does state her embarrassing weight … and it’s 127. With the help of for-profit media upheld by advertisers who make billions off unattainable beauty ideals, many of us have come to believe a very distorted picture of what it means to look like (or weigh like or fit into clothes like) a “normal” woman. Along with the idealized images of women’s bodies we see nonstop in all forms of media, the vast majority of the weights or dress sizes we ever hear or see in mainstream media are carefully selected and often distorted. They are generally in reference to models and celebrities ranging from size 00-4 (sometimes 6, and it’s usually treated as a real act of bravery to admit it), and though media makes them sound totally standard and “average” for any woman, we know that they are not representative of many regular, healthy women all over the world who often feel like abnormally large monsters when they compare their own weights or sizes to those declared by celebrities or casually thrown around in TV or movie scripts. The average model is 5’11” and 117 lbs (which is considered severely underweight, even according to the BMI). That does not mean every person with those stats is unhealthy, but we do know that with the exception of a few, most women would have to go to unhealthy extremes to get anywhere near those measurements. The vast majority of women we see in any form of media are very thin, not to mention digitally altered, softly lit, and styled by an entourage of experts from the roots of her hair to to the tips of her toes. But what about those female celebs who do appear to be of a more normative size and weight than runway models? Their weights and sizes should sound a lot more like the middle/higher end of the spectrum, right? They’ll make us 127-lbs-and-up gals feel less freakish, right? If, by chance, the beautiful women we see in popular culture are not very thin, they often publicly profess to being a size or weight that does not seem to be reflective of their actual measurements. Take Kim Kardashian for example. (There’s no need to explain who she is at this point.) When ridiculous backlash against her body size came up in 2011, Kim blogged to her fans that she loved her cellulite and “va va voom” figure and they should embrace their own bodies. Just weeks later, she made sure the world knew that she was a “curvy size 2” and no bigger. But Kim isn’t alone in claiming a size that seems to be much smaller than her actual self. After media controversy swirled around Jennifer Love Hewitt and Jessica Simpson gaining weight in recent years, both women set the record straight by simultaneously claiming they “loved their curves” and were very happy with their “size 2” figures (note: this was before Jessica’s pregnancy and media frenzy over her post-baby weight). Or take 5′ 9″ singer/actress Jennifer Hudson, who told reporters in 2007 she weighed 140 lbs., after dropping 30 since her American Idol days. She said that in a sea of size 2 celebrities, she enjoys representing the “real women*” out there with her healthy figure. But after signing a contract with Weight Watchers in early 2010, she self-reported to have lost 80 lbs. total, and wears a size 4- 6. If we do the math based on what she has told the press, that means the curvy singer would currently weigh 90 lbs. (170 lbs. during Idol, 140 lbs. in 2007, -50 with Weight Watchers in 2010 = 90 lbs!) Unlikely. Take a glance at full-length shots of Kim Kardashian, Jennifer Love Hewitt, Jessica Simpson, or Jennifer Hudson, and then grab a pair of size 2 (or 4) jeans. Something tells us these celebs are telling a dangerous not-so-white lie to the girls and women who adore them and who can’t help but compare their own real weights and sizes to these potentially very misleading claims. Blame it on vanity sizing or only wearing extremely stretchy clothing, but either way, publicly claiming to wear a size at the lowest end of the spectrum is significant for every girl or woman who compares that claim to her own clothing tags. No wonder our perception of “average” or “healthy” is incredibly skewed toward thinness and unreal perfection. Since we’ll see billions more images of women in media than we will ever see face to face, we must counteract those images with reality. Lexie and I got a glimpse of some refreshing reality freshman year of college when one of our friends (who was pretty thin-looking and very athletic) confidently and casually stated that she weighed 165. We had never heard any girl or woman share their weight that was anywhere over about 135. We never made a big deal of it at the time, but it was so incredibly informative to hear that number — that was higher than we assumed and higher than we had been taught was acceptable for a healthy girl or woman — spoken confidently, with no apologies or shame accompanying it, and from a healthy, active girl. What does normal look like? What do accurate weights and heights look like? For starters, we recommend looking around you. We can’t let media messages, whether in paid advertising or casually thrown in entertainment media, define “average,” “normal” or “healthy” for you. Numbers can’t do that. Numbers are so unbelievably specific to individuals and not comparable for different heights, body types, ethnicities, ages and lifestyles. Those numbers we do ever hear in media (and often from peers or family) are carefully selected, engineered to drive profits for weight-loss companies, cosmetic procedures and other appearance-related products, and also distorted to sound more like the media ideals. We can’t blame a celebrity (or any girl or woman) for claiming to be a weight or size she might not actually be, because we know very well the pressure women face to fit those ideals and the backlash that accompanies not fitting those ideals. We have a strategy for rejecting these lies, and it begins with sacrificing our reliance on the numbers: weight, BMI, measurements and clothing sizes. They are so beyond arbitrary that it is shocking. Don’t believe me? Then read my research on the BMI. Then read my research on how to measure real health and fitness. Still tempted to base your health or your worth or the success of your day/week/year on what jeans size you’re wearing? Then go get a pair of jeans at Ann Taylor or Old Navy or Banana Republic and get the same size/style from Forever 21 or Express or Target and see the definition of “arbitrary.” Throw away your scale, or at the very least, hide it so it’s only convenient to get to it every 6 months or so. 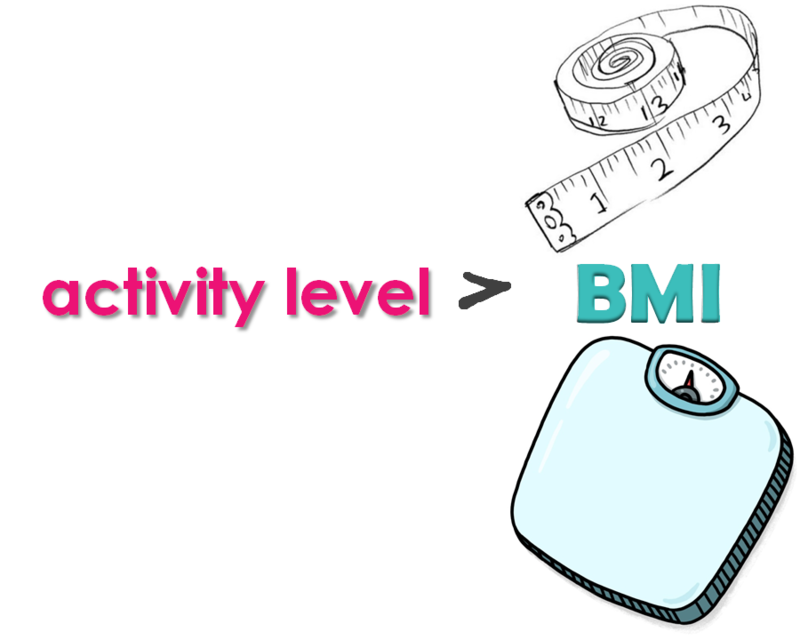 Never calculate your BMI again, and forget whatever it told you about your health category. 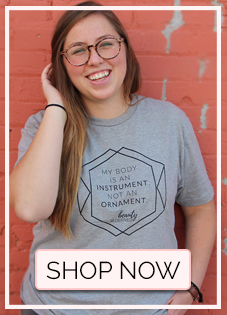 Buy whatever clothing size fits you properly and helps you feel comfortable enough to not picture what you look like all day long and self-objectify yourself away from exercising, eating a healthy diet and being successful in every area of life. And please, please, please don’t let your value and worth go up as your size goes down, and vice versa. The numbers we should be focusing on are the number of minutes you spend engaging in physical activity, your heart rate, your blood sugar, your cholesterol and your best friend’s phone number (so you can call her to get her on board with this whole thing). Along with fighting media lies using our own beautiful realities, let’s institute a policy of honesty — what we might consider the best policy — particularly between mothers and daughters! One of our supporters recently shared with us that she grew up with a very messed-up perception of heights and weights because her mom always lied about how tall she was — exaggerating her height by at least 3″, which left our friend feeling “like a clumsy giant, enormous in comparison to her, and so confused why I felt so very large in comparison,” considering she was only two inches taller than her mom’s self-proclaimed height. For this reason, she says, ” I will never fib to my daughters or anyone else about how tall I am or how much I weigh or any other measurement.” Lots of us have experienced feelings of being dreadfully abnormal when comparing our own measurements to the exaggerated claims of others. We must normalize reality. We must work on taking back beauty every single day. Moms can do so much good in normalizing real weights and sizes by telling the truth to daughters and sons who might not get to hear other real info about bodies from media or self-conscious friends. That doesn’t mean we all need to go around declaring our dress size or weights — in fact, we would strongly recommend that you do not do anything of the sort. Regular discussion of those numbers is often not necessary or helpful for the well-being of ourselves or others. As women, we are taught to be so fixated on those numbers that they come to define us, and determine our happiness. Have you ever stepped on a scale in the morning only to see a number that was slightly higher (or lower, in some cases) than what you hoped for? Did it tank your mood, lead to discouragement or shame and contribute to unhealthy decision throughout the following day or week? Been there. Skip the scale. Your reflection does not define your worth, and neither does your weight or dress size — no matter how it compares to Kim Kardashian’s claims. Need more help developing body image resilience that can help you overcome your self-consciousness and be more powerful than ever before? 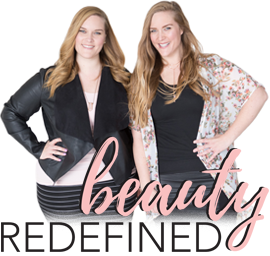 Learn how to recognize harmful ideals, redefine beauty and health, and resist what holds you back from happiness, health, and real empowerment with the Beauty Redefined Body Image Program for girls and women 14+. It is an online, anonymous therapeutic tool that can change your life, designed by Lexie & Lindsay Kite, with PhDs in body image and media. *ALL women are “real women.” Tall, short, thin, regular, curvy, large, whatever. We hate those ideas that only curvy women are “real.” The only women that are un-real are the ones that have been digitally created using Photoshop.